Deja has always lived a very active lifestyle, being born to a mother who was a personal trainer, women’s self defence instructor, and whole foods nutritionist, her life has revolved and evolved around health and fitness. Deja’s passion for fitness started with long distance running, then into body weight training as she began entering races such as Tough Mudder and The Spartan race. From here her fascination with the endless capabilities of the human body began to grow. She completed her 250 hour yoga teacher training through Langara College in 2016, and her CanfitPro Elite Personal Trainer Specialist Certification shortly after. Deja’s passion for education flourished as she entered her career, taking all of the seminars and certifications that she could. Including but not limited to: Agatsu Kettlebell level 1&2, Agatsu Indian Club and Mace, Agatsu Upper and Lower Body Mobility, TRX suspension trainer, Bulgarian Bag, and Trigger Point. Taking her love of teaching, Deja also taught NASM and PTAG at the British Columbia Personal Training Institute for a year. As Agatsu’s BC affiliate, Deja takes the name as a guide to live by. Agatsu standing for beginners mind, Deja strives to always be a student and to seek better understanding. The full name, masakatsu Agatsu is one Deja takes to heart and you will see in her way of training clients. At Agatsu BC, you will feel welcomed, comfortable, ready to take on any challenge ahead of you, and have fun while doing it. It is truly a community that strives to be the best version of themselves, while cheering on those around them. 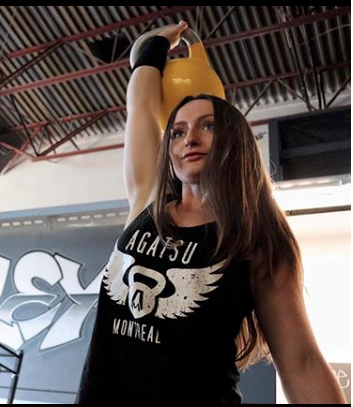 Deja’s favourite training tool is the kettlebell, for her it induces a state of flow and moving meditation. It’s also a pretty fun form of cardio! Her training includes many tools, ranging from body weight, to maces, to barbells. The programs that Deja’s clients receive vary as well, as her number one goal is to introduce you to or elevate your passion of fitness, whether that be anything from Olympic lifting, hand balancing, or general fitness.